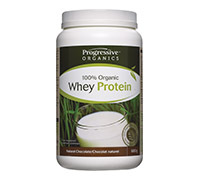 Progressive® Organics Whey Protein is made entirely from certified organic, non-GMO ingredients. The protein itself is derived from the milk of organically farmed cattle that are raised without the use of steroids, antibiotics or milk inducing hormones (including rBGH). Their diet is completely free of pesticides and fertilizers and they are grass fed and pasture raised on small family farms in accordance with organic regulations. Progressive® Organics Whey Protein is lactose reduced, gluten free and contains the full spectrum of amino acids which are essential for the maintenance of good health. It will mix easily into your favorite beverage, but in order to keep it in its most natural state, it has not been instantized. For best results use a blender. foods. Each and every ingredient is certified organic and is held to the highest organic standard.